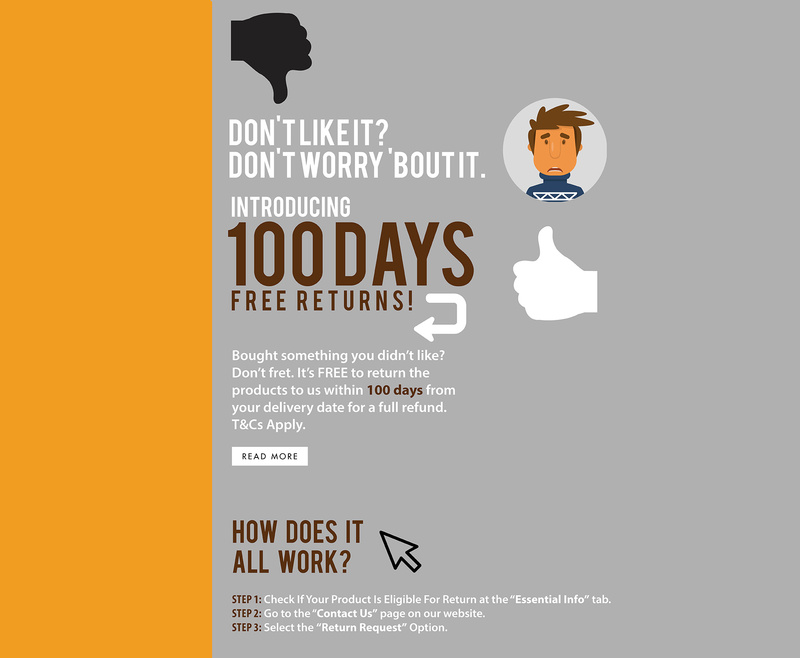 Introducing 100 Days Free Returns! Don't like it? Don't worry 'bout it. Bought something you didn't like? Don't fret. It's FREE to return the products to us within 100 days from your delivery date for a full refund. Bought from us over the last 100 Days? We've got you covered! For customers that bought from us 100 days before 3rd March 2017, you are automatically covered from the day you receive your first delivery. How do we make your purchase worry-free? You may choose not to pay first and reject the product upon delivery at no charges if you do not like it. With our cash on delivery option (available for selected products), you don't have to pay for the products before the item gets delivered! We tasked ourselves to maintain a desired level of quality in the products we offer to customers and continually improve our company's ability to ensure that our products will meet quality standards. Bought our products that are selling cheaper elsewhere? We’ll match that price and refund you the difference within 14 days of your purchase!